These are second generation microfiber bags that are 99% efficient. 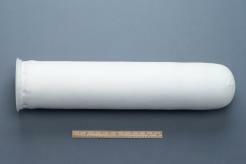 This filter bag is a hybrid design, combining features of filter cartridges and regualr filter bags. The result is superior depth, pore gradient and seamless construction. These seamless filter bags have exceptionally low tensile strength, and provide superior resistance to channeling, unloading, bypass and other forms of traditional leakage that result from pulsating water.